According to an article published in Science, the thickness of the Greenland ice sheet as a whole has been growing at the rate of 5.4 cm/yr (following correction for isostatic uplift). The only areas thinning are selected coastal areas exposed to periodic warm ocean oscillations. This change is also consistent with the natural behavior of ice sheets. i) The years 1995 to 2005 have been characterized by generally increasing temperatures at the Greenland coastal stations. The year 2003 was extremely warm on the southeastern coast of Greenland. The average annual temperature and the average summer temperature for 2003 at Ammassalik was a record high since 1895. The years 2004 and 2005 were closer to normal being well below temperatures reached in 1930s and 1940s (Figure 2). Although the annual average temperatures and the average summer temperatures at Godthab Nuuk, representing the southwestern coast, were also increasing during the 1995-2005 period, they stayed generally below the values typical for the 1920-1940 period. ii) The 1955 to 2005 averages of the summer temperatures and the temperatures of the warmest month at both Godthaab Nuuk and Ammassalik are significantly lower than the corresponding averages for the previous 50 years (1905-1955). The summers at both the southwestern and the southeastern coast of Greenland were significantly colder within the 1955-2005 period compared to the 1905-1955 years. iii) Although the last decade of 1995-2005 was relatively warm, almost all decades within 1915 to 1965 were even warmer at both the southwestern (Godthab Nuuk) and the southeastern (Ammassalik) coasts of Greenland. iv) The Greenland warming of the 1995-2005 period is similar to the warming of 1920-1930, although the rate of temperature increase was by about 50% higher during the 1920-1930 warming period. v) There are significant differences between the global temperature and the Greenland temperature records within the 1881-2005 period. While all the decadal averages of the post-1955 global temperature are higher (warmer climate) than the pre-1955 average, almost all post-1955 temperature averages at Greenland stations are lower (colder climate) than the pre-1955 temperature average. An important question is to what extent can the current (1995-2005) temperature increase in Greenland coastal regions be interpreted as evidence of man-induced global warming? Although there has been a considerable temperature increase during the last decade (1995 to 2005) a similar increase and at a faster rate occurred during the early part of the 20th century (1920 to 1930) when carbon dioxide or other greenhouse gases could not be a cause. The Greenland warming of 1920 to 1930 demonstrates that a high concentration of carbon dioxide and other greenhouse gases is not a necessary condition for period of warming to arise. 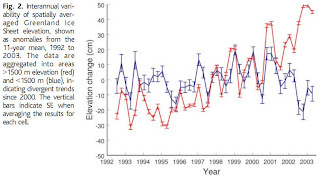 The observed 1995-2005 temperature increase seems to be within a natural variability of Greenland climate. A general increase in solar activity [Scafetta and West, 2006] since 1990s can be a contributing factor as well as the sea surface temperature changes of tropical ocean [Hoerling et al., 2001]. 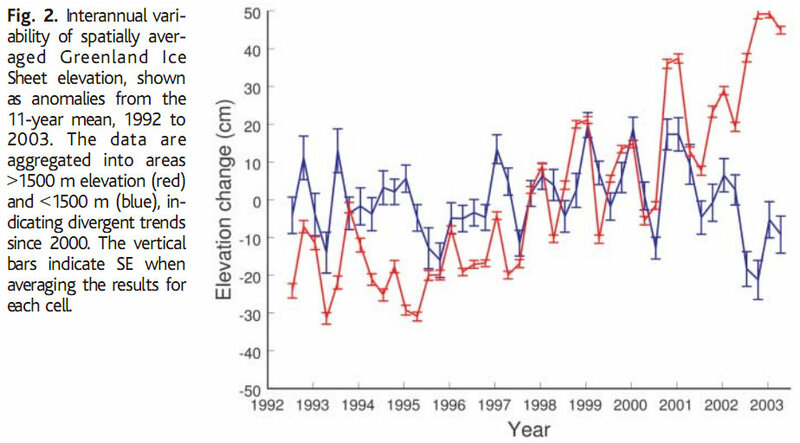 The glacier acceleration observed during the 1996-2005 period [Rignot and Kanagaratnam, 2006] has probably occurred previously. There should have been the same or more extensive acceleration during the 1920-1930 warming as well as during the Medieval Warm period in Greenland [Dahl-Jensen et al., 1998; DeMenocal et al., 2000] when Greenland temperatures were generally higher than today. The total Greenland mass seems to be stable or slightly growing [Zwally et al., 2005]. To summarize, we find no direct evidence to support the claims that the Greenland ice sheet is melting due to increased temperature caused by increased atmospheric concentration of carbon dioxide. The rate of warming from 1995 to 2005 was in fact lower than the warming that occurred from 1920 to 1930. The temperature trend during the next ten years may be a decisive factor in a possible detection of an anthropogenic part of climate signal over area of the Greenland ice sheet. Copyright 2006, American Geophysical Union. Was Nashville's flood caused by global warming?